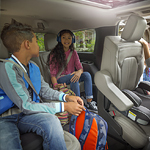 Back to School Carpool Tips to Keep Everyone Safe | Grand Prix Motors Inc. It's time to gather up your closest friends and come up with a new school year carpool schedule. These carpool tips are going to help organize the needs of the parents and keep kids safer too. One of the best things you can do concerning your carpooling group is to designate certain days for certain parents. When parents know Friday is the day for the same person, there is less of a chance of confusion. An added benefit, the kids pick up quickly when a particular parent drives on a specific day, making sure they get into the right vehicle more timely at school. The kids are creatures of habit, so teaching them how to get in and out of the vehicle each day will keep them safer in the long run. The kids need to understand they can only enter and leave your vehicle curbside from here out. At Grand Prix Motors Inc., we have a full line of new family-friendly vehicles on the lot available for a test drive.